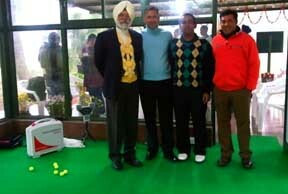 Chandigarh , 3 Jan : The Chandigarh Golf Club Academy was inaugurated by Jeev Milkha Singh on 3rd January, 2010. Director of the Academy Harmeet Kahlon and Joint Director Ajay Gujral showed Jeev Milkha Singh the various training aids and gadgets designed to make the learning experience of junior golfers more enjoyable and precise. Jeev said “I’m very pleased to see the new Academy come up at my home course. It is great to see the Chandigarh Golf Club take initiative in improving its learning facilities for all levels of golfers”. According to the Honorary Secretary of the club Nippy Ghai “the Academy will help our junior golfers learn golf in a more systematic method thus improving their performance”. The president of the club Birinder Singh Gill and Captain of the course IPS Mann also shared with Jeev Milkha Singh the course improvement matters suggested by David Hemstock and Nic Davies who have paid one liaison and two other visits to the CGC till date. Jeev was told that David Hemstock and Nic Davies shall be advising the CGC on course improvement matters for the next six months and in case their advice is good then they shall be asked to make a 5 Year Roll On Plan for Course upkeep and improvement. According to Jeev Milkha Singh “the tie up with foreign consultants is a step in the right direction and will immensely benefit Chandigarh Golf Club to keep its course maintained at the highest level”. Birinder Singh Gill, President of Chandigarh Golf Club ended the ceremony by saying that “It is a great moment for all of us at Chandigarh Golf Club. It will be our endeavour to add new gadgets and training aids regularly to our Academy to facilitate our coaches at the club for a better teaching and learning experience”. Why the world is concerned for Pakistan?